Cambodian leader Hun Sen makes a surprising comparison with Pol Pot – and shows he’s on an election footing. 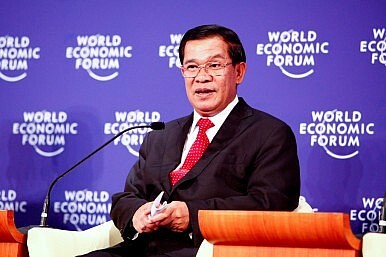 Cambodian Prime Minister Hun Sen has put his country firmly on election footing. Six months ahead of commune elections, and more than 18 months before the next national poll is due, the Cambodian leader launched an unexpected broadside that has significantly upped the political ante. He pulled no punches as he stepped into opposition heartland recently and stunned an audience of 3,000 graduating students by likening the Sam Rainsy Party (SRP) to Pol Pot, who’s brutal Khmer Rouge led this country between 1975 and 1979, when as many as 2.2 million people perished. He told students that the SRP was violating human rights by forcing its members to swear they will vote for the party and to hand over their mobile phones the night before commune elections, scheduled for June, because SRP officials feared last minute defections. “These issues are a serious violation of universal human rights and it looks like detaining people in the same way they did during the Pol Pot regime,” he reportedly said. Sam Rainsy, who heads the SRP, is in self-imposed exile in France following a conviction for encouraging villagers living along the Cambodia-Vietnam border to uproot border markers. Tensions at the border around the Preah Vihear temple where Cambodia and Thailand have fought numerous deadly skirmishes have eased, with both sides pulling back and Bangkok about to be handed a bill for damages at the Cambodian site. Hun Sen had reveled in the diplomatic brawling with Thailand, which had also handed the prime minister a fantastic issue he used to whip up nationalist sentiment and political support at home. He has also appeared to settle another antagonizing issue over pending legislation governing NGOs, which has split the NGO community and led to accusations of government bullying. He now says the legislation won’t be passed until an agreement was reached, effectively defusing the debate with NGOs, which represent a large section of Cambodian life through an extensive reach into the Cambodian countryside. The courts have been active too. Although Cambodia has a long way to go before ending its atrocious reputation of impunity, locals have been riveted by the latest legal shenanigans. This obviously includes the trial of former Khmer Rouge leaders. But also in the dock are corrupt government officials linked to Chea Sim, President of Hun Sen’s Cambodian People’s Party (CPP), and anti-drugs czar Moek Dara and former Minister of Interior anti-drug chief Cheng Leng. The idea that such people could be charged with corruption was previously unheard of. Hun Sen is dealing with his critics, and with Preah Vihear missing from the domestic political agenda – and probably too much time on his hands – the prime minister has re-focused his efforts on Cambodia’s rapidly changing demographics. A generation of children who never knew war are growing-up and are about to vote. Traditionally, the youth vote has lent towards the SRP. Hun Sen’s front foot election strategy took him straight into the classroom, where Sam Rainsy can longer tread for what he says are politically motivated charges. Either way, the region’s longest serving leader is now well poised for the upcoming polls.